Younglee's industrial valves factory is one of the first class quality industrial valve manufacturers in China, it produces various kinds of industrial valves, including High pressure ball valves, 1 piece / 2 piece / 3 piece ball valve, hydraulic ball valves, 3 (three) way ball valves, four way ball valves, gate valves, check valve, globe valve, butterfly valve, etc. High pressure ball valves are usually used as hydraulic ball valves. We are one of the first class quality hydraulic ball valve manufacturer and suppliers in China. We produce high pressure valves as below. Our factory manufacture hydraulic ball valves high pressure in a wide range of sizes of various types as below. · Body, ball and stem: Carbon Steel / Stainless steel 304, 316. · Lever: Carbon steel (galvanized)/ Zinc alloy / Stainless steel 304, 316. Hydraulic ball valves stainless and high pressure ball valves stainless steel are used in applications where there is corrosion. · Ball seat: POM / PTEE. · O-rings: NBR / VITON / FPM. 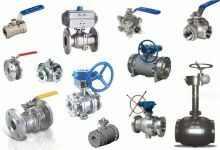 We are high pressure ball valves suppliers of sizes: 1/4", 3/8", 1/2", 3/4", 1", 1.1/4", 1.1/2", 2"
· For flange hydraulic ball valves, the connection type is flange. 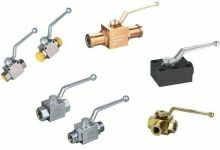 · For hydraulic ball valves with thread end, the connection thread type is BSPP, BSP or NPT. · for high pressure ball vale with size 3/4” to 2”: 315 bar, max. 420 bar. Our hydraulic ball valves can be supplied with Lockable handle on customers' request. 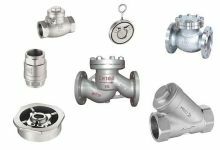 Our ball valve factory produces four different ends of connection types for the industrial ball valves, which are BSPP/BSP thread, NPT thread, Flanged connection and welded connection. For industrial ball valves with sizes below 4", usually the connection end is BSPP/BSP/NPT thread end. For big sizes such as 4 inch ball valves or bigger, the connection end will be flanged or welded. HP ball valve such as ball valve 5000 psi, 3/4" high pressure ball valve are available on customer's request. Stainless steel 304 /316, carbon steel, WCB, LCB, LCC, CF8, CF8M, CF3, CF3M. ▪ Dimension range: NPS 1/2"～56"
As one of the first class quality industrial valve manufacturer, beside the industrial valves above, we also produce below different types of valves. · Dimenision: 1/8" - 1"
· Dimenision: 3/4" - 3"
· Dimenision: 2" - 24"